1. Heat oil in a medium sized pan, add onion and saute until it turns soft. To this add ginger garlic paste and saute until it raw smell leaves. 2. Add all vegetables one by one and saute them. Add salt when vegetable gets cooked. Sprinkle water if needed. Vegetables should be almost cooked. 3. Then add turmeric powder, chili powder, coriander powder, garam masala powder. Add ¼ cup of water. Close the lid and keep in low flame for 5 min. 4. 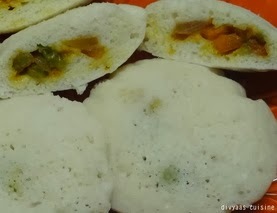 In the idly pan, pour half scoop of idly batter and then place the stuffing in the middle of the batter. 5. Then cover the stuffing with another half scoop of batter. Steam for 10-15 min. It takes usual time as it takes for cooking normal idly.